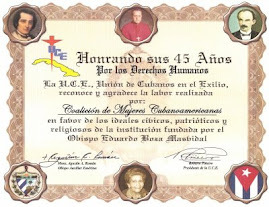 In attachment, two human rights report (in Spanish) sent from Cuba via email by BERTA SOLER FERNANDEZ, the leader of the peaceful civic movement "Ladies in White", that documents the acts of repression carried out by Cuban authorities against human rights defenders during two weeks: OCTOBER 24 - NOVEMBER 6, 2016 when they tried to attend mass and continue with their ongoing campaign #TODOSMARCHAMOS ("WE ALL MARCH") on behalf of the freedom of all Cuban political prisoners and the defense of human rights in Cuba. October 24-30, 2016 - A total of 106 human rights defenders became the victims of systematic acts of repression and arrests that included members of the Ladies in White and activists of different NGO's in the island. For Oct. 31 – Nov. 6, 2016 there was a total of 114 activists, victims of systematic acts of repression. NOTE: The Cuban government has incremented its repression to the point that it is succeeding in preventing the participation of members of the ‘Ladies in White’ as well as of Human Rights Defenders in Sunday Mass and in the peaceful “Todos Marchamos” campaign. Repressive forces begin to surround the homes of these activists three or four days prior to Sunday (when the churches are surrounded as well), in particular, the headquarters of the Ladies in White in Havana, located at: Calle E, #51 e/ Cumbre y Porvenir, Reparto Lawton, Municipio 10 de Octubre. The activists are violently arrested as they try to leave their homes to attend Sunday mass in Havana and in other provinces of the island. A total of 75 Ladies in White were arrested before they were able to attend mass on Sunday, Oct. 30, while 31 women were unable to do so. A total of 67 Ladies in White were arrested on Sunday, Nov. 6 while only 26 women were able to show up at the church service. Up to the present reports, the regime has snatched a total of 26 Cuban flags away from the activists during the past weeks when they attempt to protest peacefully in the streets. Denia Fernández Rey, Yenisleidis Peralta Álvarez, Santa Fernández Díaz, Maria Lina Perdomo Duran, Ilianna Cedeño Ávila, Reina Rodríguez Cañada, Liane Seguí García and Marielis Manzano Carballo. Oct. 26 – Fourteen members of the group Ladies in White in Matanzas were arrested and prevented from participating in the group’s monthly Literary Tea held in Havana: Amada Ramona Herrería Rodríguez, Odalis Hernández Hernández, Marisol Fernández Socorro, Cira Vega de la Fe, Hortensia Alfonso Vega, Sissi Abascal Zamora, Annia Zamora Carmenate, Aleida Cofiño Rivera, Caridad Burunate Gómez, Tania Echeverría Menéndez, Maritza Acosta Perdomo, Mayra García Álvarez, Lazara Rodríguez Roteta and Dianelis Moreno Soto. Oct. 27 – Five activists who had been arrested in May 25, 2016 and accused of “disorderly conduct” for carrying out a peaceful demonstration in front of the Capitol Building in Havana, and had spent 6 months in prison without a trial, were released after their ruling was modified. Their families were contacted by a tribunal, without the consent of the prisoners, and told that they had to pay a bail of $1000 for each prisoner in national currency (moneda nacional). The activists released were: Henry Rey Rodríguez,Jose Antonio Pompa López, Luis Andrés Domínguez Sardiñas, Emir González Janero and Ibrahim Alemán Urrutia. Nov. 2, 2016 – Carlos Manuel Figueroa Alvarez was violently detained at the entrance of the headquarters of the Ladies in White in Havana and was then subjected to a brutal beating at the police unit where he was taken. No one at the pólice unit would provide information of the wherabouts of this activist. Nov. 6, 2016 – During her arrest in Havana, Berta Soler Fernandez was scratched and, once inside the patrol car, a female police agent bit her right hand while another agent beat her neck and kept pulling her hair while she yelled at Berta: “I’m going to pull it out, black woman!”, in addition to calling out numerous obscenities at her. The police driving the patrol car also offended and threatened Berta. Igdaris Perez Ponciano (Havana) was brutally beaten on the face when she was introduced inside the patrol car and the handcuffs were placed so tight around her wrists that she suffered pain and lacerations. NOTE: Activists who try to reach the headquarters of the Ladies in White are subject to violent acts of repudiation organized by the Department of State Security and the Communist Party. These human rights defenders are verbally offended; eggs and rocks are thrown at them; they are exposed to acts of vandalism; they are pushed inside their house when they try to leave; they are arrested as well as threatened to be taken to prison if they continue going to the headquarters of the Ladies in White. NOTE: Several Cuban State Departments that are complicit with the repressive apparatus of the Department of State Security (DSE) are: Ministry of Culture, Public Health, Education, Transportation, Basic Industries and Electricity. · Prevented from exercising their right to freedom of worship, of speech, or of peaceful association. · Forced to remain as "prisoners" inside their homes under siege. · Homes are searched and vandalized (personal possessions that include furniture, documents, books and supplies used for their pro-democracy activism, including cell phones, computers, flash drives, CDs, most sent from abroad, are confiscated or destroyed). · Personal belongings seized (including money) are never returned. · Subjected, alongside their family, to death threats. · Children of human rights defenders are also exposed and subjected to cruel and inhumane treatment and even arrested alongside their parents. · Children whose mothers remain under arrest during 24 hours or more, are unable to attend school during the time their mothers are imprisoned. · “Deported” from Havana to their province of residence or are taken by force to a distant province where they do not reside. · Subjected to violent "acts of repudiation" (gov't sponsored mob attacks) that last for hours when they are verbally humiliated, insulted, dragged by the hair, scratched, kicked, punched, pinched, shoved, bitten and even injected with unknown substances with a needle and syringe. Their clothes and shoes are torn off, and they are often left exposed or in their underwear. · Cuban Department of State Security (DSE) is using minors in organized “acts of repudiation” to verbally and physically attack peaceful human rights defenders. · Subjected to brutal beatings with cables, pieces of water hoses and sticks as well as to Judo choking techniques that result in injuries such as fractures, cuts, dislocated joints, concussions, lacerations, bruises, swelling, etc. that require medical assistance. · Arrested with violence and taken to Centers of Detention & Torture in Havana by members of the Dept. of State Security (DSE) who wear uniforms & drive patrol cars of the National Revolutionary Police (PNR) as a diversionary tactic and thus be able to transfer the activists to these detention centers where they beat them with impunity. · Subjected to repeated arrests within a 24-hour period. · Arrested and taken to undisclosed locations; their whereabouts unknown to their families and friends. · Guarded and handcuffed for hours. As a form of cruel & degrading treatment, their hands are forced behind their backs with metal handcuffs or plastic strips placed tight around their wrists to cause serious injury, swelling, cramps, and fatigue. · Pepper sprayed during arrest. · Subjected to hours of verbal and psychological torture as well as blackmail by the political police who humiliate them while under arrest. · Forced to remain hours locked up inside a sun exposed enclosed patrol car under high heat temperatures. · Detained in prison cells in unsanitary, inhumane conditions where rats and roaches abound. · Abandoned in the late evening hours far from their towns and cities of residence in deserted and dangerous areas where they could be assaulted and/or raped. · Are filmed by State Security agents. · Issued “warning reports” (actas de advertencia) that accuse them of delinquent behavior such as “resistance”, “disorderly conduct”, assault (“atentado”) or “disobedience” ("desacato"). · Arbitrarily accused of committing delinquent criminal acts such as “resistance”, “disorderly conduct”, “assault”, “dangerousness” or “disobedience” and imprisoned indefinitly without trial. · Fined after being accused of committing criminal offenses. · Threatened to be taken to prison if they do not stop their activism. · Activists and their families are promised monies and privileges if they stop being part of the human rights movement in Cuba. · Robbed and beaten after they pick up money at Western Union sites, that is sent to them from abroad by Cuban exiles who support their human rights struggle. · The Cuban flag is taken away from them as they go out to march and protest peacefully onto the street. The following 4 Ladies in White were arbitrarily arrested and transferred to Cuban prisons for peacefully exercising their civil rights in the island: Xiomara de las Mercedes Cruz Miranda, Yaquelin Heredia Morales, Aimara Nieto Muñoz and Martha Sánchez González. The following 15 activists were arrested and remain in prison without a trial: Miguel Borroto Vazquez, Mario Alberto Hernandez Leyva, Leudis Reyes Cuza, David Fernandez Cardoso, Lazaro Mendosa Garcia, Yuneth Cairo Reigada, Marietta Martinez Aguilera, Aurelio Andres Gonzalez Blanco, Ibrahim Alemán Urrutia, Alberto Valles Pérez, Pablo Enrique Camero, Ismael Boris Reñí, Yosvani Lemus Martínez, Yeusandro Ochoa Leiva, Felix Juan Cabrera Cabrera y Armando Peraza Hernandez. The Coalition of Cuban-American Women make the Cuban government responsible for the physical and mental well-being of all members of the peaceful human rights movement who struggle on behalf of freedom and justice for the Cuban people. The lives of these human rights defenders and their families in Cuba are in danger. We urgently ask ongoing solidarity for these brave men and women in the island of Cuba from the international community: dignitaries, journalists, NGO's and all men and women of good will in the world. The Coalition of Cuban-American Women is a non-governmental organization whose membership is devoted to denouncing human rights violations in Cuba and disseminating information about those violations throughout the world. In addition, the Coalition advocates for the Cuban people, in particular peaceful members of the opposition movement in Cuba, political prisoners and their families, women, and children whose human rights are denied by the Cuban government. Begun in September, 1995, The Coalition is based in Miami, Florida, but its membership includes women from across the United States and Europe. The Coalition is responsible for translating and disseminating articles, letters, and testimonies written by prominent dissident leaders in Cuba that highlight human rights violations and other acts of repudiation carried out against them by the Cuban government. Members of The Coalition regularly speak at academic conferences and before international human rights organizations, such as the Inter-American Commission of Human Rights of the Organization of American States. For love of homeland and humanity ~ Por amor a la patria y a la humanidad.